It doesn't take the strongest taste or smell to stir memories. Nor does it take the most complicated one to delight us. Time and time again, I realize that the best things in life are the most simple; petite madeleines are among such things and so are sweet little scents in Laurence Dumont's Gourmandes collection. Like in food criticism, where, I imagine, it is easier to talk about a complicated haute cuisine creation, describing layers and intricacies of its taste, so in writing about perfume: I talked at length about various complex Lutens fragrances, but I am stumped by an enjoyable straightforwardness of a Dumont. 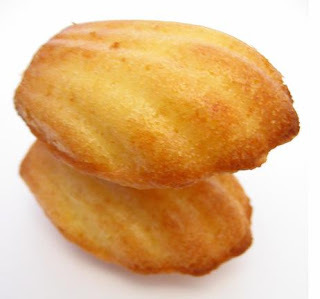 Tendre Madeleine is a soft, delicately sweet vanilla with hints of almond and cinnamon. It starts that way and it does not change. That's it, done with the review. When faced with fragrances like Tendre Madeleine, it is easier to talk in images and emotions: it makes me feel cozy, safe, pleased with the world. It's watching an "aunt dip a little madeleine in the boiling infusion"...it's being cuddled in the arms of someone who won't let anything happen to you...it's cuddling someone small and helpless...it's simple pleasures. Available at lushoasis.com, $59.00 for 100ml. Image source, Tuki on flickr.com. Got a sample of this today and have yet to try it. Must do so before going to sleep tonight. Actually sounds like the perfect scent for falling asleep. I think it's meant to be worn to bed! It's fluffity-fluff, but everyone needs at least one like that in their collection, right? I like fluffity-fluff. Even if I only wear it to bed. And the price-point makes it guilt-free, right? You had to quote Proust;) I am done for. If only all it took to be "cozy, safe and pleased with the world" were a bottle of Dumont's creation! Do you think you could arrange for the great creator to inject some into wandering clouds and let it rain down over the globe? Maybe then we'd have peace on earth- in lands where war is the reaper and in our own families, when dissonance rents our souls. Please send a bottle to the Almighty, when you get a chance! Columbina- there are 2 new Oud sites that have a really nice selection and excellent customer service- Oudhasi.com and AgarAura.com. I highly recommend Oudhasi's Assam 15 and Assam Flora. I'm excitedly waiting for samples from AgarAura and would be happy to share my thoughts when they arrive! Those cookies look good....I need sugar....anyway, I think we all have those go-to comfort scents. Mine are PG's Un Crime Exotique and Tan Giaducelli's Annam.....the latter is sadly discontinued. Sounds yummy to me! Comfort scents are good in any "flavor!" I adore Un Crime as well!